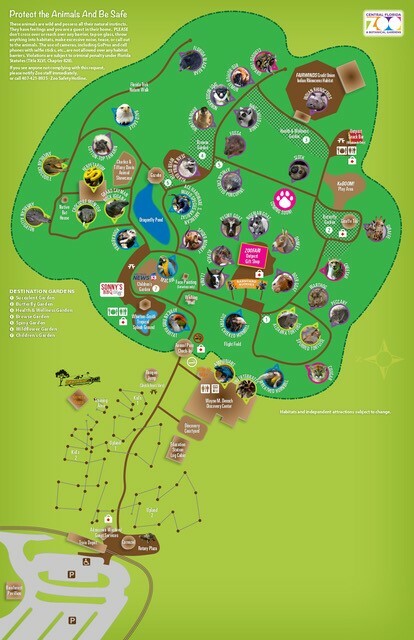 What to know for your visit to the Zoo. For the safety of our animals, staff, volunteers, and other visitors to the Zoo, we ask all guests to follow the Zoo's Laws of the Jungle. For the health of our animals and guests, smoking and vaping are not permitted in the Zoo. No selfie sticks allowed inside the Zoo. Cameras, including GoPros, cellphones, etc., are not allowed over any habitat barriers. Our animals are on special diets. Please do not feed the animals. Only service animals allowed inside the Zoo. Please leave your pets at home. For the safety of our animals, cups with disposable lids and straws are not permitted inside the Zoo and are not offered at our concessions area. No outside food, coolers, radios, frisbees, roller skates, skateboards or wheeled shoes permitted inside the Zoo. No outside alcoholic beverages allowed on Zoo property. To protect our guests and animals, please do not throw any objects. For your protection, please do not climb or sit children on railings or fences. Family-friendly attire and appropriate footwear required. Please refrain from wearing apparel with offensive language or graphics. All photos taken at the Zoo by our guests are prohibited from commercial use. Your photo may be taken during your visit for use in Zoo promotions. If you wish to decline, please notify a staff member. The animals you will see during your visit are wild and possess all of their natural instincts. Please remember that you are a guest in their home. Please do not reach or cross over any barrier, tap on glass, throw anything into habitats, make excessive noise, tease or call out to the animals. If you see anyone not complying with these rules, please notify a Zoo staff member immediately.